Most of us utilize PC to perform daily operation such as document writing, web browsing, computer programming and etc. But how many of us really know and understand what hardware (CPU, chipset, motherboard, graphics) are running behind the system that help offload some of these daily tasks? 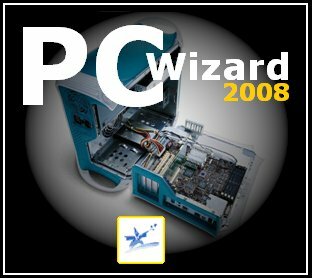 There is one famous software utility with the name of PC Wizard 2008 developed by CpuZ that will be able to reveal these information without the need to dissect the whole PC system. This powerful utility lets users to inspect everything ranging from processor, chipset, memory, video, hardware ports and whatever connected to motherboard that you can think of. Besides normal detection on which hardware components and models are running in your system, it also displays analytical data on your hard disk, RAM, cache, video performances and much more, making it a complete system benchmarking tool for those users that would like to understand how their systems perform as compared to others. The software utility is definitely simple to be used for beginner that would like to understand more on their system components as well as experienced system integrators that curious to find out on bottleneck and performance in more details. Depending on users’ preference, it is free for download at CpuID in both ZIP package and self installing EXE package. Not to worry about the maintenance and compatibility, the developer always ensures that all the new technologies and standards are supported by having release updates from time to time. You will be surprised with all the system details that it can gather in short time and yet it is free for use.